The recent Supreme Court decision concerning the Washington, D.C., handgun ban, District of Columbia v. Heller, is a big win for American gun owners because simply banning firearms is no longer an option. Now that an individual right to arms has been confirmed by the Supreme Court, firearm prohibitionists can only accomplish their goal of civilian disarmament by regulating the Second Amendment out of existence. In order to do this, they must frighten the public into demanding such strict regulation that possessing firearms, legally, becomes onerous. This fear can be created by emphasizing the costs to society of private firearm ownership, while hiding the benefits. Biased research has been, and now will continue to be, a favorite tactic that will permit gun-banners to chip away at our Second Amendment rights by showing the need for one new “reasonable” regulation after another. The Black Market First, however, anti-gunners need to repudiate their nemesis--the ubiquitous black market, which grows stronger with each new restriction. The black market is responsible for the estimated 1 to 2 million guns illegally possessed by 8 million New York City residents, even after a century of punishing Sullivan Law licensing regulations. There is probably no American gun owner alive who has not seen or heard of the bumper-sticker phrase: “When guns are outlawed, only outlaws will have guns.” It was black market greed that has armed violent criminals in NYC. The firearm-prohibitionists need to show that the black market can be defeated--even if the research “proving” this is a hoax. If it cannot be “proven,” and if the regulation of firearms is counter-productive to a safe society, then their philosophy and tactics appear foolish and impractical. Enter Phillip J. Cook. In November 2007, Cook, a highly respected anti-gun criminologist, was the lead author of an article titled “Underground Gun Markets.” Cook described how, with law enforcement becoming proactive in a small gangland “hot-spot” of a Chicago slum, the black market could indeed be manipulated. We do not dispute that, in certain locales--for a short time--gun acquisition might be rendered more difficult. But in the long run, the black market inevitably wins out. Economist R. T. Naylor explained, “never in history has there been a black market defeated from the supply side . . . .” Supply-side controls, like the Sullivan Law’s handgun licensing requirement, merely serve to increase availability of, and profits from, the illegal item or service. But their conclusion now has standing in the literature, and will be readily cited by those who intend to implement post-Heller regulations. Maximizing The Costs Cook, with co-author Jens Ludwig, also an anti-gun criminologist, created another factoid that will be of value to those committed to increased civilian firearm regulation. In an attempt to maximize the cost to society, they brazenly created an estimate of the cost of gun violence in the U.S.: $100 billion per year. Cook and Ludwig arrived at their contrived figure by conducting a survey of 1,204 adults. They asked respondents if they would pay $50, or $100, or $200 in increased taxes in order to reduce firearm-related crime by 30 percent. They then extrapolated their figure to arrive at what the total number of households in the U.S. would be willing to pay to eliminate firearm-related violence by 100 percent. The sleight of hand here is equating what people in their survey sample would be willing to pay to reduce gun violence with the actual cost of gun violence. Then, adding in jury awards and other estimated costs, they arrived at a nicely rounded, easily remembered figure of $100 billion per year from gun violence. ... they brazenly created an estimate of the cost of gun violence in the U.S.: $100 billion per year. Although admitting that the tangible dollar cost was minimal, they hoped that they would “provide some leverage in moving the policy debate … .” And they did. This figure is parroted now as if it were a scientifically proven fact, instead of merely smoke and mirrors. 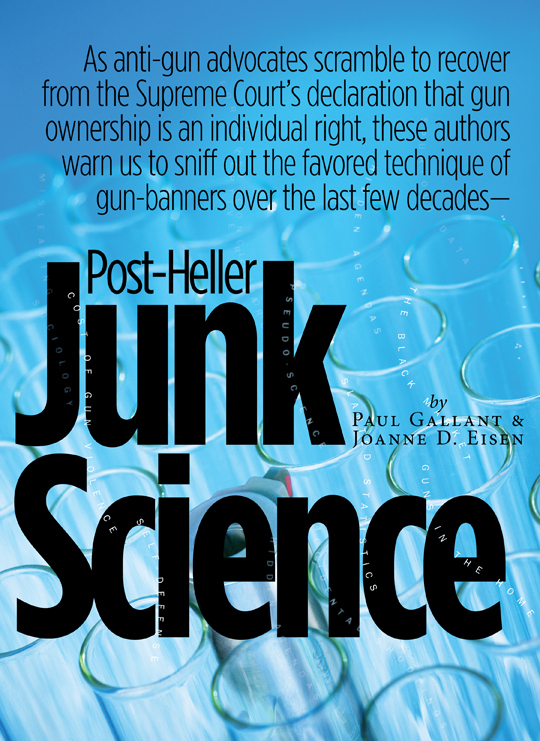 We reluctantly recommend lining the pockets of Cook and Ludwig by purchasing their book, Gun Violence: The Real Costs, in order to see, firsthand, the junk science that is designed to manipulate legislative battles by faking increased social costs. The tactic often used by this author and others--combining firearm-related homicide with firearm-related suicide--allows them to statistically increase the number of firearm-related deaths. The CDC’s June 28, 2006, National Vital Statistics Report: Preliminary Data for 2004 (the most recent published statistics) listed firearm-related homicides in the U.S. at 11,250, and firearm-related suicides at 16,603. Using the combined number maximizes the perceived danger firearms pose to society. The New York State Department of Health’s Task Force on Life and the Law, in “Caring for Severely Ill Patients,” noted that there are “pervasive and serious shortcomings in the care of termi-nally ill and chronically ill patients … .” Instead of fear mongering, addressing these shortcomings in end-of-life care would more surely reduce suicides than confiscating firearms from civilians. Yet Wintemute neglected to tell the full story of DGU estimates.